The chassis and suspension of the Firebird is GM’s second-generation F-Body so it shares its architecture with the 1970–1981 Camaro. The Chevy and Pontiac teams in Trans-Am racing (as well as GM itself) developed the geometry of this suspension and it was a big step forward from the previous suspension in 1969. Similar to other GM chassis, the second-generation F-Body featured double-stamped A-arm front suspension, and the ball joints on a spindle join the upper and lower arms. 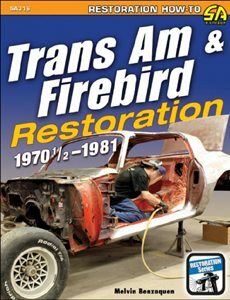 The suspension of your Firebird has an enormous impact on the driving experience. The suspension must be in good working order for the car to handle properly and drive as it did when new. 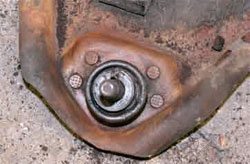 The bushings and ball joints are wear items and are prone to failure from either use or age or both. 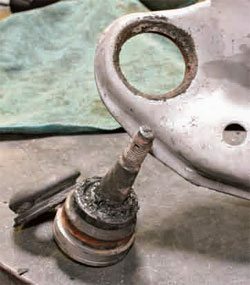 After 33 years or more, the rubber bushings have most likely dry rotted and cracked, rendering them unable to perform their job properly. Up front, the 1970– 1981 Firebirds were equipped with unequal-length upper and lower control arms. After 30-plus years, suspension components such as ball joints, tie-rod ends, shocks, and springs are often worn out and need replacement. Rebuilding a suspension, especially the front, is extremely difficult and dirty work. 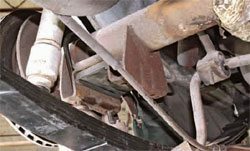 It can be dangerous because the front coil springs are under intense pressure and become lethal weapons if improperly removed or installed. Make sure that the body is properly supported. I recommend removing one side at a time and re-installing it before moving on to the other side unless you have a lift and a full complement of shop tools. The tools you need to work on your suspension are a pickle fork, coil-spring compressor, hammer, sockets, and wrenches. 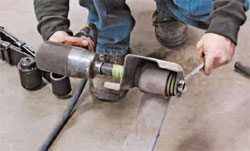 A good floor jack also is needed and a hydraulic press is necessary for pressing the front suspension bushings and ball joints out and back in. Before you tear into the car and start disassembling the suspension, you should perform a thorough inspection to ascertain its current condition. The suspension should be in top condition not only for high-performance applications, but also for safety. Sagging springs, broken ball joints, and failed bushings all can affect how your Firebird handles everyday driving. Even the smallest pothole or a dip in the road can cause a worn-out suspension to react improperly, resulting in an accident. You can closely inspect the alignment shims at the upper control armmounting points and count how many are installed on each side. 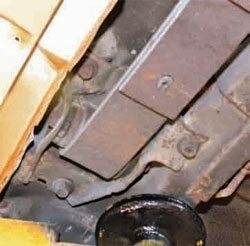 If one side has many more shims than the other side, it can indicate an alignment problem or possibly some accident damage. 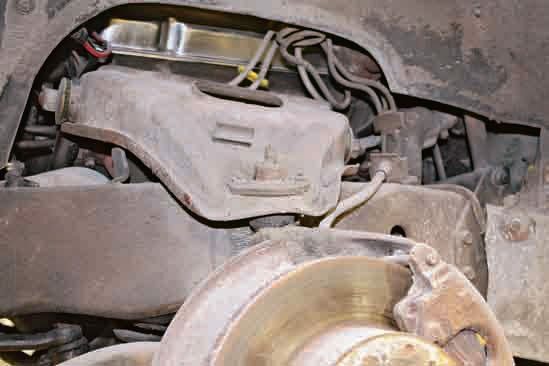 If the front end wasn’t properly straightened after an accident, but rather had more shims added to attain the correct alignment, it’s a problem. 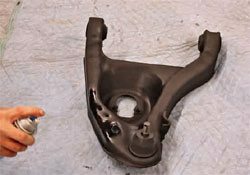 To verify if the front subframe has been bent, see if the alignment holes line up correctly. If the control arms are bent, it’s difficult to see, but added shims may compensate for this. 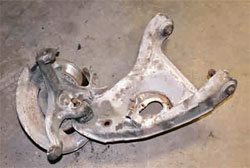 If the Firebird has been in an accident and you have not noticed it until now, you need to enlist a shop with a proper frame machine to straighten the front end or the subframe may need to be replaced. If your frame is straight, it’s a matter of replacing the worn bushings, ball joints, tie-rod ends, and other pieces so the car drives well and safely. When contemplating which parts to replace on the suspension during your restoration project, I can say only one word: everything. Any part that is considered a wearable item should be replaced, and if you want to have a balanced and correctly operating suspension, you need to be sure that all parts are new and functioning like new. That’s why you should not integrate old parts with new parts. 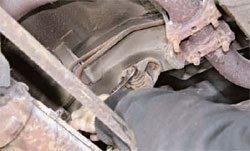 Look underneath the car to determine the condition of the four rubber bushings between the frame and floorpan. These compress, crack, and expand over time, so you may need to replace them. Rear springs typically sag over time, but do not always require replacement. I rarely recommend replacing the front coil springsunless they have sagged. Why? When the factory specified the front coil springs, it was to a particular engine, transmission, and optional equipment. The 1970–1981 Firebirds have many different part numbers for springs. However, the aftermarket sources only list a few replacement springs. 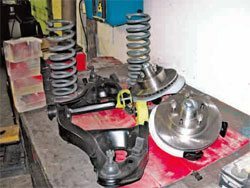 An incorrect coil spring can affect ride height (it may sit too high or too low), handling, ride softness or stiffness, and create other issues such as bottoming out when hitting everyday bumps. Before you start disassembling the suspension, you need a game plan. 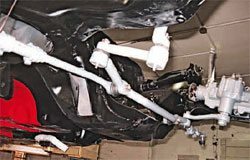 If you’re planning to do a frame-off restoration, you can easily separate the front subframe and rear suspension from the body; the body can be mounted on a rotisserie. Once you have removed the front clip from the car, you can remove the front subframe, engine, transmission, and rear suspension; you’re left with a body shell. After the hood has been removed, you can pull the engine and transmission out through the top of the car. Then, you can remove the front subframe from the bottom. You can keep the wheels on the front spindles, and, with a floor jack supporting the front subframe, you can wheel it around on your garage floor very easily. You need to remove all fuel lines, brakes lines, and the emergency brake cable. 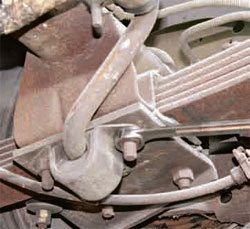 Six bolts hold the front subframe to the car, and once those are removed, you can simply roll the subframe out from underneath the car. 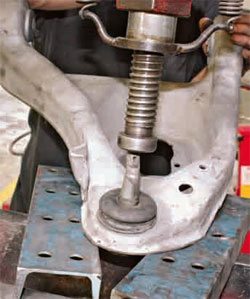 If you’re doing a frame-off restoration, remove the two bolts at the bottom of the core support, the two bolts that go through the firewall in the mounting pad, and the two bolts that attach the subframe to the cage nuts. 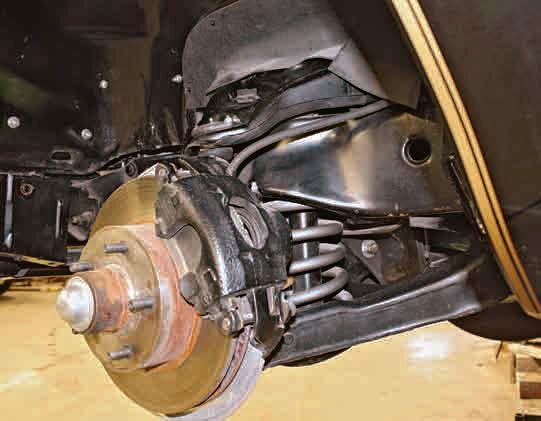 The front suspension is the most difficult part of overhauling your suspension. It is important to pay attention to where everything goes. Count the tie rod threads at the adjusters on both the inner and outer tie-rods. This gets your suspension close to the pre-disassembly settings. This allows the car to be movable and easier to steer before you take it to the alignment shop. Contact alignment shops in your area and make sure they have the original specifications for your car. Some do and some do not want to be bothered with older cars. 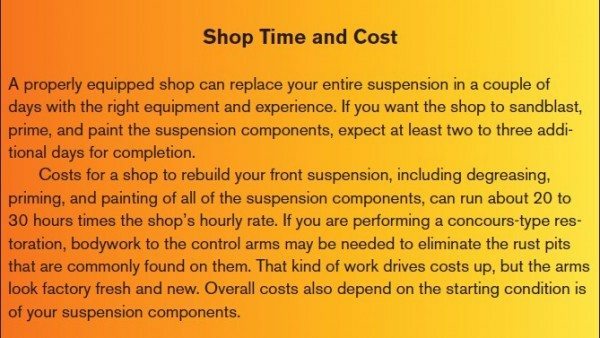 Do not have the front suspension aligned until the car is fully assembled because any weight differences change the settings and you’ll have to revisit the alignment shop. 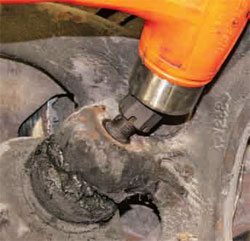 It is necessary to remove the cotter pin and nut to the upper ball joint. Support the lower control arm with a floor jack. 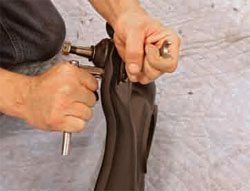 Install a coil spring compressor onto the spring and tighten it so that the compressor holds the tension. 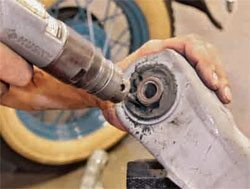 Take the removed nut, turn it upside down, and re-install it onto the ball joint stem. Thread it several turns so that the nut is just covering the stem end. Hit the nut with a hammer to break the ball joint loose from the steering knuckle. This is a complete front suspension deluxe kit with tie rods. 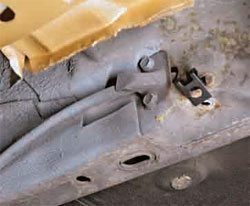 Over time, bushings, ball joints, and chassis isolators absorb energy, crack, and wear out. Tie-rod ends and bolts are designed for only so much use. A kit such as this not only improves handling and comfort, but these fresh parts help the front suspension to function as designed and enhance safety. If your car has more than 70,000 miles or it’s been 10 years or more since the front end components have been replaced, it’s time to replace them. This secondgeneration Firebird has experienced years of road grime that has accumulated on its upper control arm. This upper control arm has had the steering knuckle removed. 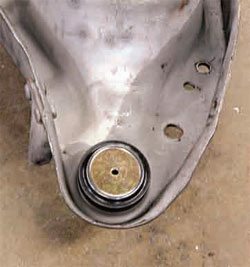 The upper nut holding the steering knuckle to the upper control arm was removed with a wrench until it was a few threads from the end. A pickle fork and a hammer were used to separate the control arm from the steering knuckle. The nut was then removed. 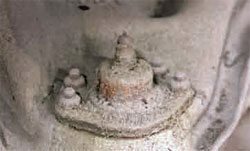 The shaft seen here is part of the upper ball joint. Here is the lower control arm and tie rod. If that does not work or if you are not making much progress, you’ll have to use a pickle fork. Hammer the pickle fork between the upper control arm and the upper part of the steering knuckle over the stem of the ball joint. Leave the castle nut installed so the nut prevents the upper arm from flying up when the tension is released. Once the tension is released, remove the nut slowly, and separate the upper arm and the knuckle. Remove the cotter pin and castle nut on the outer tie rod. Turn the nut upside down and thread it back onto the stem until flush. Hit the nut with a hammer until the tie rod pops loose. Remove the nut and pull the tie rod out of the steering knuckle end. Remove the brake caliper, and using a wire, hang it from the frame. Do not allow the flex hose to hold the weight of the caliper. 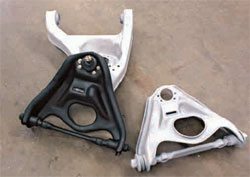 The nuts and bolts hold the lower control arm assembly to the subframe and can be removed using wrenches or a wrench and socket and ratchet. It may be necessary to soak the threads with PB Blaster if removal is difficult. 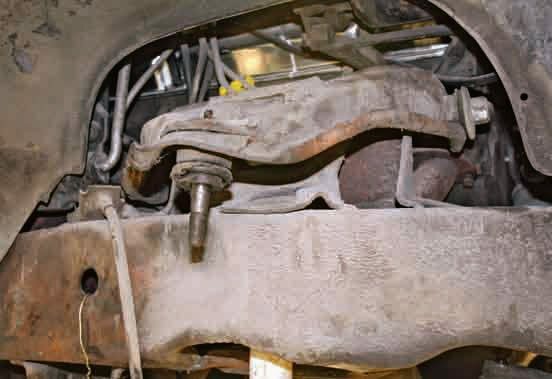 This shows the upper ball joint has been previously replaced (you can tell that because it is held in by nuts). This is an original ball joint. It still retains the factory rivets. Two nuts hold the upper control arm that bolts to the arm shaft and subframe. Use a 3/4-inch wrench to remove the nuts. If you find shims between the shaft and frame, remove them. You can reinstall them later. Remove the lower ball joint cotter pin and castle nut. Reinstall the nut upside down until flush with the stem. 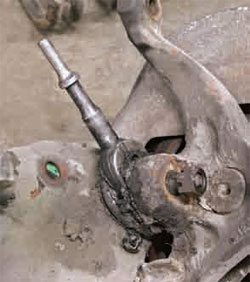 The steering knuckle sometimes requires a hammer to break it away from the arm. If using a hammer is not successful, try a pickle fork. It has tapered ends that allow the leading edge to get between the control arm and the steering knuckle. Hit the fork with a hammer; eventually the two components separate. Here are the components all apart. The old bushings generally do not remove easily. Drilling out the rubber parts helps release the bushing tension. This makes removal easier. When bushings are seized in the arm, removal is sometimes very difficult. It may be necessary to place the arm in a vise and then hammer and chisel the bushing out. The bushing sleeve requires a chisel and hammer to remove. Now the bushing is ready to remove. Using a hydraulic press, press out the ball joint from the arm. Make sure there is room for the ball joint to pop out below. The press is basically a bottle jack with a handle and the process is not unlike jacking up your car to change a flat tire. Now the ball joint has been removed from the arm. Press in the new ball joint using a hydraulic press and flat steel on one side. Make sure the opposite end is open enough to allow the ball joint to clear any obstructions. Press in the new bushings with a hydraulic press. Using a hydraulic press is not difficult, but it requires even pressure on the push side to force the bushing into the arm. Press in the new bushings. 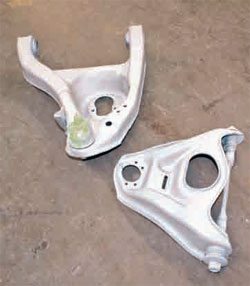 If you are sandblasting, priming, and painting the suspension parts, I recommend that the sandblasting be performed once the bushings and ball joints are removed. Once you have finished sandblasting, press in the new bushings and ball joints. Tape and prime them followed by painting. Installation of the ball joints and bushings usually damage the paint if done after painting. However, it is your decision as to the order of installation. The control arms should have been sandblasted in a cabinet or scraped and cleaned with a degreaser before getting to this step. Make sure the metal is completely dirt- and grease-free by using Prep Sol. Spray the control arms with DP-50 epoxy primer. The primer is sprayed straight without any reduction for thicker coverage and to provide additional durability. 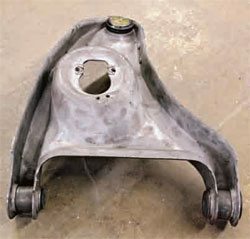 Make sure the primer has completely dried and the primer finish is clean with no significant imperfections in the surface of the control arm. If the surface did pick up some contamination, sand the affected areas and respray with the epoxy primer. You can use a coat hanger or wire to hang suspension parts for painting. However, you can also paint suspension parts in a clean area of the workshop on the floor. Apply several light coats of paint. Spray one side and let it dry completely; then turn the control arm over and paint the other side. The color is a satin black or you can use a product called Hot Rod black. Eastwood also sells Chassis Black, which is close to the factory color. I do not recommend using any type of brush-on paint products. Simply peel the tape off that was used to mask the ball joint from paint overspray. Tighten the nuts on the ball joints and confirm everything is ready for installation. At this stage, the complete suspension is ready to be installed. To install the upper and lower control arms, install the nuts and bolts into the subframe retainers. 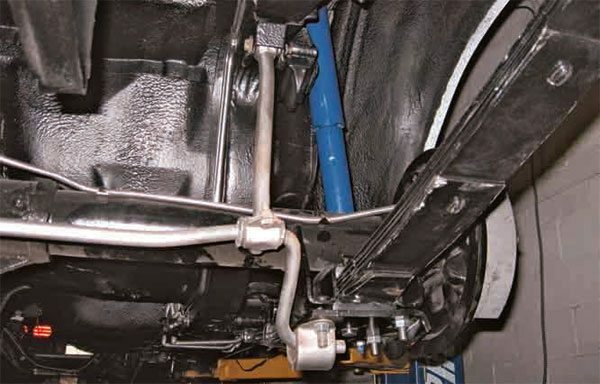 Install the coil spring into the subframe upper pocket and the lower control arm seat. Using a floor jack placed under the lower control arm, jack up the control arm until the lower ball joint stud pokes through the lower part of the steering knuckle. Install the nut on the ball joint stud and tighten. Place the upper control arm ball joint stub in the upper steering knuckle opening and attach the nut. Tighten the nuts. 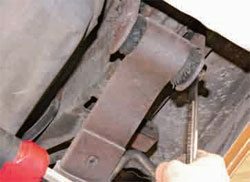 Make sure all the steering knuckle bolts are tightened prior to removing the coil spring compressor. Steering cleaned, painted, and installed. 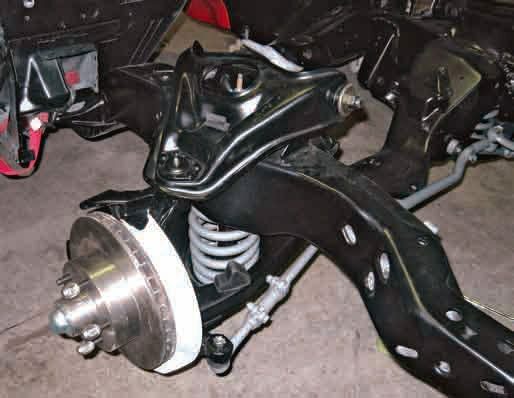 The second-generation Firebird rear suspension consists of leaf springs, rear sway bar, shocks, and a live solid rear axle. It is a tried-and-true setup. Installing urethane bushings in the leaf springs enhances performance of the rear suspension, axle pads, and sway bar. The removal and assembly of these is quite simple. Three bolts hold the front spring pocket in, and one bolt and nut is held in at the back and through the lower shackle. The upper part of the shackle also has a single bolt and nut that slides through the rear part of the frame rail. Two T-bolts on the inboard side and one U-bolt on each outboard side of the spring hold it and the rear axle in place. Most parts deteriorate over time. The entire car rests on the suspension, and the rear springs have been placed under a load since the car was new. After years of being subjected to the weight of the car and/or aggressive driving, the springs lose their spring rate and need to be replaced. 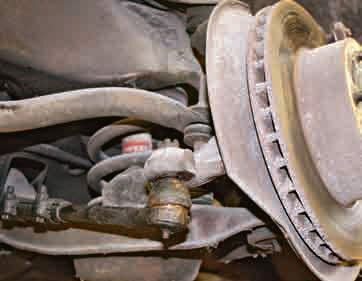 The bushings also deteriorate over time. 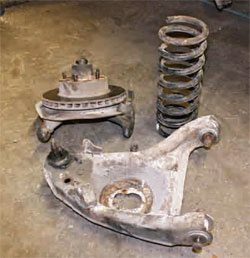 A typical rear-suspension restoration kit includes U-bolts, shackles, axle pads, and leaf springs. Well before a Firebird starts riding low in the back, you should have fresh leaf springs installed on your Trans Am or Firebird. This is not only for comfort, but also for safety. 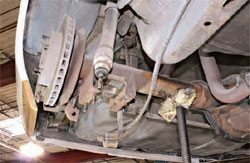 If the springs are worn out and compressed, the suspension system of the car is out of balance, and handling can become dangerous. Remove the lower sway bar nuts using a ratchet and socket. Allow the sway bar to swivel out of the way. The shackle nuts are often rusted together and may require an air ratchet to free them. You may need to soak the threads with PB Blaster for a few hours. Remove the three front mounting bolts with a socket and ratchet. Remove the upper sway bar link nut and put the sway bar to the side. Once the old hardware and parts have been freed, you can install the new shackle bushing. Slide the upper bolt through the frame rail. 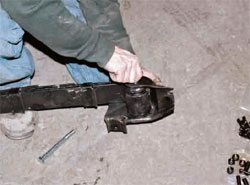 Remove one leaf spring assembly side at a time. Support the rear axle to make installation easier. Remove the front mount from the old spring. This is the mount with the three bolts that you just removed in Step 3. Install the mount onto the new spring by placing it over the bushing, as it was before you removed it. The single bolt and nut slides into the eye of the bushing through the bracket. Use a socket and ratchet with a wrench or two wrenches. Replace the bolt clips on the body by sliding them into place where the old one was just removed. Install the mount with the spring attached onto the body. Use a ratchet and socket to install. Install the rear part of the leaf spring onto the rear shackle. Place the rear part of the spring against the shackle and slide the bolt into the spring bushing center. Use two wrenches. Place the upper insulator pad between the axle and spring. Make sure it sits flush. Install the new lower insulator pad below the spring. The center opening places it over the center spring stack bolt. A rear-suspension restoration is essential for top performance and safety. The rear leaf springs have been installed. New hardware and bushings are also essential.